Birgita brings to the CeRDI team extensive experience in ecology and environmental management, contributing to improving the management and dissemination of biodiversity knowledge. Her research to date has focused on understanding the ecological response of birds to modification of their habitat, which has included studies into riparian restoration in agricultural landscapes and waterbird monitoring at local and continental scales. Birgita is a long-term member of the volunteer-run Victorian Wader Study Group and an executive committee member of the Australasian Wader Studies Group. She is currently working with private land owners, Landcare groups and Natural Resource Management bodies in northern and south-western Victoria, to improve the science and practice of restoration and land management. Birgita completed her PhD at Monash University in 2009 on conservation genetics of Leadbeater's Possum. 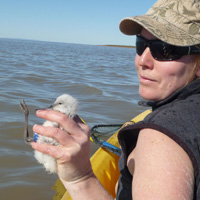 A commitment to improving the management of waterways, wetlands and estuaries for the conservation of birds is the motivation behind research being conducted by Dr Birgita Hansen. Birgita has a long-standing history of working with volunteers in shorebird conservation. She has many years' experience in the field of ornithology, specialising in wetland and waterbird conservation and management. Her research has made an important contribution to policy and planning in fields of conservation genetics, riparian restoration and waterbird conservation. She is currently leading projects on digital innovation in environment, climate and natural resource management. She is also leading a collaborative project investigating the movement patterns and habitat use by Latham's Snipe. This study is part of a larger research programme she is developing aimed at improving the management of wetlands in western Victoria by working in close collaboration with community groups, private land owners and Natural Resource Management bodies. I recently lead a collaborative project with BirdLife Australia, the University of Queensland, the Arthur Rylah Institute (DELWP) and the AWSG to revise the East Asian-Australasian Flyway population estimates for 37 migratory shorebird species listed under the Environment Protection and Biodiversity Conservation Act. This project was funded by the Australian Government Department of the Environment and Energy. I am on the editorial board of Emu Austral Ornithology, Corella and Stilt (the shorebird journal of the East Asian-Australasian Flyway). I was the editor-in-chief of Stilt between 2011 and 2016. I am actively engaged in shorebird monitoring and conservation as both a volunteer and a professional. I also provide expert advice and targeted field survey for waterbird, shorebird and other avian monitoring and research programs. Hansen BD, Clemens RS, Gallo-Cajiao E, Jackson MV, Kingsford RT, Maguire GS, Maurer G, Milton D, Rogers DI, Weller DR, Weston MA, Woehler EJ, Fuller, R.A. (2018) Shorebird monitoring in Australia: a successful long-term collaboration among citizen scientists, governments and researchers. In 'Monitoring threatened species and ecological communities'.Pp. 149-164. In: Legge, S., Lindenmayer, D. B., Robinson, N. M., Scheele, B.C., Southwell, D.M. & Wintle, B.A. (Eds). Monitoring threatened species and ecological communities. CSIRO publishing, Melbourne. Hansen, B.D., Minton, C.D.T., Harrison, A.E., & Jessop, R. (2014). Conservation assessment of the Sooty Oystercatcher Haematopus fuliginosus. International Wader Studies, 20, 161-172. Taylor, I.R., Newman, M., Park, P., Hansen, B., Minton, C.D.T., Harrison, A., & Jessop, R. (2014). Conservation assessment of the Australian Pied Oystercatcher Haematopus longirostris. International Wader Studies, 20, 116-128. Hansen B, Gooderham J, Garland I, Murphy D, Feely P, Sharman M, Bonney P, Dahlhaus P. (2018) National WaterbugBlitz: Citizens assessing Australian waterways. Australian Citizen Science Association Conference, Adelaide, Australia. 7-9 February 2018. Hansen B, Wilson D, Honan J, Chamberlain R, Stewart D, Gould L (2017) Building an understanding of habitat use, movement and migration of Latham's Snipe. Australasian Ornithology Conference, Deakin University, Geelong, Australia, 8-10 November 2017. Schultz N, Good M, Hansen B and Milne R (2016) Tree decline in the agricultural landscapes of South Australia. 11th Australasian Plant Conservation Conference. Melbourne Botanic Gardens, Melbourne, Australia, 14-18 November 2016. Hansen B, Feely P, Abeywickrema S, Plucinski P, Gillett H, MacLeod A (2016) EstuaryWatch and WaterWatch portals: a collaborative research partnership to develop online tools to enhance citizen science, data collection and provision, and information sharing. Australian Society for Limnology Conference, 26-30 September 2016, Ballarat. Milne R and Hansen B (2016) Engaging communities for prioritising natural resource management and biodiversity conservation actions (Conference Paper). CEUR Workshop Proceedings 1570, 36-40. Hansen B, Honan J and Stewart D (2015) What is the relative importance of urban wetlands for Latham's Snipe in south-west Victoria? Australasian Ornithological Conference. Adelaide, 25-29 November 2015. Thompson H, Dahlhaus P, Milne R, Hansen B and MacLeod A (2015) The NRM Planning Portal: matching regional and local priorities to identify partnership opportunities in catchment management. Australian Citizen Science Conference 2015: Maximising the Capacity of Citizen Science for Science and Society. Canberra, 23-24 July 2015. Hansen B, Jones C and Pearson H (2015) Does riparian condition influence breeding success in woodland birds in highly modified landscapes? Goulburn Broken CMA Research Forum. Shepparton. 21 May 2015. Hansen B (2013) Does riparian condition influence breeding success in woodland birds in highly modified landscapes? EcoTas13. Aotea Centre, Auckland. 34-39 November 2013. Hansen B, Reich P and Lake PS (2013) Riparian zone widths, restoration objectives and catchment land use: management guidelines.Biodiversity Across Borders. Federation University Australia, Mt Helen. June 2013. Box P, Hansen B, Bradsworth N and Kostanski L (2018) An evaluation of proponent environmental data under the EPBC Act. CSIRO Land and Water. Hansen, B. (2018). Latham’s Snipe surveys of the proposed Yumbah Nyamat abalone farm, Dutton Way, Portland. Centre for eResearch and Digital Innovation, Federation University Australia. 19p. Hansen BD, Fuller RA, Watkins D, Rogers DI, Clemens RS, Newman M, Woehler EJ and Weller DR (2016) Revision of the East Asian-Australasian Flyway Population Estimates for 37 listed Migratory Shorebird Species. Unpublished report for the Department of the Environment. BirdLife Australia, Melbourne. Schultz N, Good M and Hansen B (2016) Final report on tree decline and death project. Submitted to the Coorong and Tatiara Local Action Plan. Federation University Australia. 82p. Dahlhaus PG, Thompson H, Murphy A and Hansen B (2016) Waterwatch and EstuaryWatch portals: a collaborative research partnership to develop online tools to enhance citizen science, data collection and provision and information sharing. Discussion paper. Centre for eResearch and Digital Innovation. Federation University Australia. 21p. Hansen B, Wevill T, Hettihewa S and Gell P (2014) Narmbool Biodiversity and Carbon Project. Unpublished report for Sovereign Hill Museums Association. Federation University Australia. Menkhorst P, Loyn RH, Liu C, Hansen B, McKay M and Dann P (2015) Trends in numbers of piscivorous birds in Western Port and West Corner Inlet, Victoria, 1987-2012. Unpublished client report to Melbourne Water. Arthur Rylah Institute for Environmental Research, Department of Environment and Primary Industries, Heidelberg, Victoria. Menkhorst P and Hansen B (2014) Investigating the utility of monitoring bird communities to inform the Victorian Index of Estuarine Condition. Unpublished client report to Victorian Office of Water. Department of Environment and Primary Industries, Heidelberg, Victoria. Natural Resource Management Planning Portal: Matching regional and local priorities to identify partnership opportunities in catchment management. Tree decline in the Coorong and Tatiara, South Australia: Using citizen science to reveal patterns of tree decline in rural landscapes. Andrew Crossley (Honours) - What is the home range and habitat preference of Latham's Snipe (Gallinago hardwickii) in south-west Victoria?